Choosing wedding love songs appropriate for your ceremony may be a difficult decision. After all, you want to express your feelings for the person you're marrying through music. Take your time in selecting the ideal song and use a few tips to help narrow your choices. When it comes to picking out a love song, only the best will do. Couples often struggle trying to find the perfect song that expresses their feelings. Personal preferences often come out during this time, and wedding stress can manifest itself into a petty argument about the love songs you will use. By planning ahead, you can eliminate headaches and disagreements. Avoid the argument by using the simple instructions below to pick out your favorite songs. You may not end up in perfect agreement, but at least you will come to an acceptable compromise. Remember that you can use soloists, instrumental pieces, congregational songs, religious love song selections and first dance wedding songs to reflect your favorite love songs. Find out if your religion has restrictions upon what can be played during the ceremony. Secular songs or even some Christian pop may not be acceptable. Opt to use those songs during your wedding reception. Ask your accompanist, soloist, or wedding DJ for lists of their most popular love songs. Mark down your favorites, then order them from top to bottom. Add any songs not listed, like a special song from while you were dating. Compare lists with your soon-to-be spouse. At this point, you will hopefully have at least two to three songs in your top ten favorites that match. 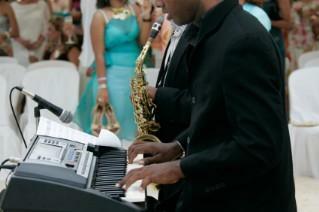 Narrow your focus further by choosing which ones to play during the ceremony and which ones to play at the reception. Couples often choose to have a special song sung or played during the wedding ceremony. The love song is often sung by a soloist, usually during the lighting of the unity candle. However, choirs, congregational songs, and instrumentals are also used throughout the ceremony. Remember to check with your officiant regarding any contemporary songs you want sung during the ceremony. Most faiths allow renditions of songs like Unchained Melody, Save the Best for Last, or Truly, Madly, Deeply but check to be sure. You may want background music played while guests mingle or have cocktails. Your wedding DJ may also provide dinner music, too. Choose love songs that are considered more along the lines of "easy listening" so that guests can chat with one another. Classical and jazz instrumental pieces are good, as are love songs for weddings by Celine Dion, Josh Groban, Amy Grant, and Bryan Adams. The first dance song is the time when you can really let your love shine. Show off your personality as a couple, too. Ultra-romantics may want to stick with classic powerful ballads, while fun-loving couples may want a country or oldies tune. No matter what you choose, toes will be tapping during the first dance as husband and wife.